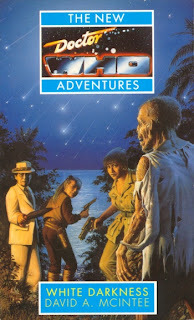 David McIntee's White Darkness, the fifteenth New Adventure, features the TARDIS crew in early 20th century Haiti during the events leading up to the American occupation. It also has them fighting Cthulhu and zombies. So it's a bit ambitious. The Cthulhu stuff is what it's best known for these days, since that becomes a bit of a theme for the New Adventures, but it's just as notable for introducing McIntee, who went on to write scads more books, and his research-heavy historical style. Reputation-wise, it's middle of the road - Sullivan's rankings have it at fortieth place, with a 65% rating. At the time newly installed Doctor Who Magazine reviewer Craig Hinton displayed a flair for the lousy pull quote by describing it simply as "an enjoyable adventure story." I, Who goes with more outright ambivalence, calling it "solid, albeit a bit passionless and unimpressive." DWRG summary. Whoniverse Discontinuity Guide entry. It’s June of 1993. Ace of Base are at number one with “All That She Wants,” unseated a week later by UB40 with “(I Can’t Help) Falling In Love With You,” which lasts for two weeks before Gabrielle takes over with “Dreams,” making this the first actually volatile month on the charts I feel like we’ve had in a while. The Spin Doctors, Janet Jackson, Tina Turner, Rod Stewart, The Pet Shop Boys, and Haddaway also chart, the latter with “What Is Love,” AKA that song from the Saturday Night Live sketch. While in the news, Andrew Wiles proes Fermat’s Last Theorem. Loreena Bobbitt does the thing that she’s famous for. Clinton orders some casual bombing of Iraq. Kim Campbell becomes the first female Prime Minster of Canada. While in books, it’s White Darkness. And thus an intersection with my life again. June of 1993 is the summer before sixth grade for me. I was, by this point, a Doctor Who fan, and it’s in sixth grade that I discovered the New Adventures. It started with finding one or two in a book store - probably either the still-open Barnes and Noble in Danbury, Connecticut or the now-closed Borders in Farmington. I know the first two books I got were White Darkness and Lucifer Rising. Memory deceives just a little bit here. I don’t remember exactly what month - it was certainly a bit later than June. I can’t quite place exactly when my relationship with Doctor Who snapped into the present such that there was such a thing as a new release. I started buying issues of Doctor Who Magazine when I saw them in the comic shop in this period, but my comic-buying days were nearing an end this year - I bailed out of them completely in the fall of 1994. So there was definitely a point around here where I became aware of the fact that new Doctor Who was coming out on a fairly set schedule, and that there was such a thing as a community responding to it. I know this must have happened somewhere in the very beginning of the school year, because I remember looking forward to the release of Blood Heat. My best guess is that it happened between Birthright and Iceberg, right as the school year began. Of the two books, however, White Darkness is the more memorable one. It’s the one I definitely think of as the first New Adventure I got. It’s also the one I alluded to back in the Mary Whitehouse entry - the one that got torn in half and shoved into my desk. I don’t think I ever nailed down who did that one. The other one of my NAs to get vandalized, Tragedy Day, I remember better - that one I rescued from being kicked around the hall. I remember vividly their excuse, that they didn’t know the book was mine, and sputtering bewilderedly as the school authorities mostly took this as a reason to treat the incident more lightly. As though, you know, playing kickabout with a book is OK so long as you don’t know whose it is. As though the people bullying me for being the weirdo who liked this “Doctor Who” thing they’d never heard would be unaware of whose Doctor Who book they were kicking. It’s strange to go back over this period and see the parallelism. I always figured I was unusual in my 1990s Doctor Who fandom. But the age-old lesson of the Hinchcliffe era bears mention. History repeats itself. Structures recur. So my outsider, bullied era of Doctor Who is the era where Doctor Who seemed most openly embarrassed about the fact that it was Doctor Who. When the series itself seemed happy to sit in the back of the classroom hoping nobody would notice it - it’s just an innocuous little book series now! You don’t have to be angry about it taking up part of your license fee to pander to anoraks anymore! For years I assumed the problem was that the New Adventures were just a bit too adult for an eleven-year-old. And there are ones that are - I was never going to appreciate Warhead at eleven. Or even the Paul Cornell books, though I did actually finish both Love and War and Timewyrm: Revelation (albeit with little clue what the hell was going on in either by the end). But returning to the books two decades later has forced me to admit that, actually, the problem really was me a lot of the time. White Darkness is a prime example - I had no idea at the time, but it’s actually an effective bit of relatively taut, economic prose in Terrance Dicks style. Of course, there are other complexities. An American eleven-year-old is unlikely to have the worldview necessary to parse a novel that is in part about the relationship between Doctor Who and imperialism, and in another part about H.P. Lovecraft. Having never heard of either Lovecraft or imperialism at the time this was fairly clearly not going to be the book for me no matter how I paid attention. Let’s start with the Lovecraft, since that’s the closest to some things we’ve been kicking around the blog for a while now. We’ve been talking for a week or so now about the transition in the 1990s towards a nonspecific and general paranoia and away from a paranoia of specifics. There are few writers more suited to this than Lovecraft. As I’ve stated before, the central premise of Lovecraft - the major horror he offers - is the prospect of an unknowable and unspeakable horror that underlies the world. (“The most merciful thing in the world, I think, is the inability of the human mind to correlate all its contents. We live on a placid island of ignorance in the midst of black seas of infinity, and it was not meant that we should voyage far.”) The Lovecraftian idea of horror, in which the universe itself is what is hostile as opposed to any definable object within it - is perfectly suited to the nineties. And though it is easy to confuse my own learning of the existence of Lovecraft in the 1990s with the general case of a nineties Lovecraft fad, the New Adventures, at least, suggest that there was an interest in Lovecraft. There are two books where we’ll deal heavily with Lovecraft, and the other one is so dreadfully problematic that it largely eclipses this one. Because while McIntee gets a lot of credit for importing Lovecraft to Doctor Who, what’s striking about White Darkness is how understated he is about it. He never goes so far as to name the Great Old One in this book, allowing it to be a lurking and unmentionable horror. This isn’t Doctor Who/Lovecraft crossover fanfic, at least not in a conventional sense. Indeed, there’s a larger issue in play with McIntee’s handling of Lovecraft, which is that the book is set in Haiti and is based on the local vodou religion, particularly the myth of zombi(e)s. Vodou, more often spelled voodoo in the popular culture spelling, where it tends to be an all-purpose synonym for black magic. But McIntee makes a real effort to take it seriously on its own terms, following particularly from the controversial work of Wade Davis, who offered a pharmacological explanation for Haitian zombie myths. This is all wrapped up in a historically-minded story about the 1915 military coup in Haiti and resultant US occupation of it. There’s a significant statement involved in doing a Lovecraft-inspired story that takes Haitian history and culture seriously. On the one hand it’s exactly the sort of thing Lovecraft would do, in that his horror was largely obsessed with the prospect of obscure cults in “primitive” societies dedicated to the worship of terrible ancient gods. On the other hand, Lovecraft mostly did this because he was a completely racist dickbag. The idea of a Lovecraft story that actually treats a predominately black culture seriously and with respect is a very clever bit of work that involves turning Lovecraft’s approach against itself and actively repairing and redeeming the text. But there’s a real extent to which this describes what White Darkness is doing more broadly for Doctor Who. It’s telling that the novel begins not just with the Doctor finally ditching that dreadful question mark pullover in favor of a new wardrobe, but with him finding the pendant given to him by Cameca way back in The Aztecs. The Aztecs is an interesting story to refer back to, generally speaking. On the one hand it’s sensible on a basic level - McIntee’s niche within the Virgin line was always as “the historical one,” and so of course the fanwank he goes for is going to be a historical. And since The Aztecs has the consensus reputation as the best historical, it’s an obvious reference. But there’s more to it. Way back in the actual Hartnell era we talked about the fact that the series did two stories set in non-European cultures in its first season, followed by roughly zero in the seasons to follow (unless you want to credit The Crusade for Islamic culture, which I don’t but won’t fault you if you do). Past that the Doctor has been the white British man who goes places and solves their problems for them. When the show has made a swing at being somewhat less white and colonialist it’s been awkward at best, as in the at times cringe-inducing “a black character in every story” approach to Season Twenty-Five. So by reaching back to The Aztecs McIntee is explicitly reaching for a road not taken within Doctor Who, in which the mandate to go anywhere in space and time actually includes things that aren’t based primarily on middle and upper class white British culture. This is something that was, originally, part of what Doctor Who was but that fell out of the concept. But there was a general decay of Doctor Who’s broad potential over the first few seasons, and the nature of this decay is instructive here. Broadly speaking, what happened was that Doctor Who became more and more straightforwardly a science fiction program. In the early days there was science fiction, sure, but mutedly so. It’s more remarkable than anyone bothers to notice that it took Doctor Who seven stories to get around to one based around humanity’s future in space. It’s fitting, in a bitter irony sort of way, that Doctor Who’s first attempt at humanity’s future in space came immediately after its last attempt at non-Western culture, simply because the two ideas were always so opposed in the first place. Because here’s the dirty little secret of our space adventure fantasies of the future: they were always just fantasies of imperialism. Our futures are always understood through the past, and with the early 20th century decline of empire we naturally projected that fantasy outwards, space being the only place in which a new terrain to conquer might be found. And so we created our space-age future, a future that was nothing more than a last, desperate stab at imperialism that came to a technologically determined nothing, dashed against the staggering and vast emptiness of space. The space helmet and the pith helmet are indistinguishable from each other. In its earliest moments Doctor Who was at least partially a counter to the space age fantasy, but over time this resistance steadily eroded until by season five the Doctor was embroiled almost exclusively in stories with the plot of “the other is attacking our colony,” and by the mid-Pertwee era the Doctor had become a science vicar dispensing his wisdom to the less civilized races of the universe. Until the 1990s, when the space age fantasy had finally crumpled, the end of the Cold War, for which the space race was always a thinly veiled proxy, serving as the final nail in the coffin of its lengthy abandonment. And so in the wake of the space age fantasy’s derailment McIntee engineers a return to Lovecraft’s hostile universe. But not the racist Lovecraft whose contrast with colonialism is his despair at the possibility of it. Instead McIntee offers a vision of a Lovecraftian universe bubbling in the erased cultures of colonialism, such that what was erased by our imperialist fantasies creeps back. This vision is maintained even to the details of McIntee’s take on Lovecraftian beasties in Doctor Who, positioning them as remnants of the past universe, literally erased and overwritten by our world. This is the overriding image of the 1990s. The lurking horror of something that is erased. The other shoe waiting to drop. A peace time borne not out of any victory, lacking any stability, bounded menacingly by a leering trail of zeroes glaring eschatologically in the distance. The nineties are a soap bubble of calm always in the midst of bursting. In this regard Doctor Who in its novel phase is a better metaphor than I could have realized at the time. A discarded relic of the past in which unusual power turns out to lurk. The image of McIntee’s book torn and shoved in my desk is almost too potent even without the associated traumas and anxieties. This is what a childhood of the nineties is - a looming unease. The realization of deep and primal structures of fear and helplessness go well in the nineties. Alan Moore, in The Birth Caul, describes his own childhood bullying as an acquisition of some foreign tongue imposed upon him, repeating that “I learned the words.” This is something oddly different, a learned unspeakability. The horror not of the social structure, but of its shocking absence. The fact that your books can be destroyed, in the very school where they tell you that reading is important, and nobody will care. That there are mean and nasty things in the world that will hurt you for the sake of it, and nobody will ever stop them. And yet I’m loathe to give up this bit of angst. Of course I am. We enjoy our symptoms. It’s one of the most basic facts of maladaption - the way we revel in our own inadequacies. I don’t want to give up my anger and frustration and confusion. I don’t want to give up the shame of crying over it, or my guilt over my own hysteria. I don’t want it to get better. This is the other part of the nineties. The strange fusion of the antihero and the nonspecific darkness. Knowing that we were all surely fucked eventually was in an odd sense liberating. Once one accepts that one lives in a capricious universe one is oddly free to go about one’s business. The New Adventures have an anger to them that Doctor Who hadn’t had in the past. This is part of why something like Lucifer Rising had so much trouble just letting go and enjoying being Doctor Who. Because there’s a curious little death drive in this. It’s fun to be the cancelled show. It’s liberating to be at the bottom. And on the one hand White Darkness points towards that, finding a giddy pleasure of discovery in the abandoned structures of the past. It’s fun to locate Cthulhu in the road not taken by Doctor Who in the 1960s. It’s clever. The fact remains that Doctor Who still, to this day, has a chronically unresolved issue with non-western cultures. The promise of Marco Polo and The Aztecs is still, nearly fifty years later, unrealized in the series and a scab worth picking at. McIntee’s iconoclastic vision is important. But equally, White Darkness is aware of the trap it risks falling into. This pleasure in picking at the scabs of Doctor Who’s various injuries is a real one, and perhaps even a productive one, but it is ultimately destructive. The anger implicit in the discarded and decaying dreams of space age imperialism, or in the cancellation of your favorite show, or in the carefully nursed anger at a school full of bullies is pleasurable, sure. But it’s still destructive anger. White Darkness interrogates the character of New Ace, suggesting that she’s only good for killing now. It’s a sharp observation, but one that might as well be turned against its own structure. Is mining the discarded past and angrily nursing the countercultural grudge going to offer anything more than tonic to a cult audience? One who can take its solace without even, strictly speaking, reading the books? Is this any way to bring back a television show? There was another bully with whom I was actually friends in sixth grade, and another New Adventure that goes with it. In the summer between it and seventh grade, however, there was a sleepover at his house that I attended. It went poorly - after intrigued looks at a stack of Playboys that another friend had smuggled to the sleepover it turned to a game of strip poker. This was past my eleven-year-old sensibilities - a bridge too far. I cowered in the other tent reading Theatre of War until I was told they were done. As eleven and twelve-year-old boys do, they opted to prank me, mooning me when I returned. I snapped, wanting to go home, causing the dissolution of that friendship. It turned into the worst bullying I ever received in my life, including, in late 1996, one of the earlier cases of cyberbullying around. I got a message from him on Facebook a year or so ago, apologizing for what happened well over a decade ago. It meant the world to me. But I couldn’t bring myself to respond. I was at a loss for words, unable to conceive of what a world where I forgave him even looked like even as I did just that. I still haven’t written back. I still haven’t actually finished Theatre of War either. Sometimes we need our wounds more than we need atonement. But I’ve finished White Darkness now. And it was good. For all its flaws, and indeed, because of its flaws. Because of its uncertain anger, its knowledge of what scab to pick but its lack of any clear knowledge of how to treat the underlying wound. Because of its desperate hope that just ripping off the bandage might be a form of healing. Because somehow, in spite of everything, this cynical surrender to the inevitability of a hazily defined breakdown is still a form of progress. Blinded by what was, we march, stumbling every step, into the present. As someone who also experienced a certain amount of bullying in the 1990s (although by your comments here I'm getting the sense I was a little bit older than you, and thus experienced the particular joys of later teenage bullying), your final comments in this entry strike a chord, Phil. Particularly in what you say about not wanting to let go -- I think you're right that on some level we do need that sense of victimhood and exclusion; it's ultimately as much a part of us as everything else that composes who we are. "It’s telling that the novel begins not just with the Doctor finally ditching that dreadful question mark pullover in favor of a new wardrobe..."
It's funny you mention this, because to be honest, absurd as it may seem, this is one of the larger reasons why I really struggled to get into the New Adventures at the time. And it might be simply because I actually like the dreadful question mark pullover, but on thinking about it, I think it also might actually have something to do with what you're talking about with regards to how the New Adventures on some level seem embarrassed to be Doctor Who, since this is in many ways -- for all that it's a development you seem to approve of -- emblematic of it. Because whether you like the pullover or not, ultimately, it has to be said that it's a pretty futile change for the novels to make. It's like how the later Sixth Doctor Big Finish audios put the Sixth Doctor in a blue suit; yes, it's getting the character out of something that looks ridiculous, but it's only doing so in a niche corner where the only people who will notice will be other Doctor Who fans (they're still wearing them in the old TV shows, which is how most people will get exposure to them anyway), and it's also doing so in a purely non-visual medium where the only visual cues (aside from the cover, that is) come from the reader's imagination anyway -- in both cases, for one reason or another, no one will see anyway. The attempt to show how grown-up Doctor Who is becoming by discarding the frivolities of the past instead seems like a slightly strained attempt to reassure Doctor Who fans (and themselves) that their show isn't silly and they aren't silly for liking it. The whole thing smacks of a slightly desperate insecurity or embarrassment. The way I see it, yes, the question mark pullover's silly, but it's ultimately not that much sillier than someone going around wearing a twelve-foot long multicoloured striped scarf, and yet no one is latching on to any excuse they can to try and to strip that from the Fourth Doctor. Because it's an emblem of the character, just as the Seventh Doctor will always have worn that pullover and the Sixth Doctor will always have worn that coat and people will see and remember them doing so no matter how embarrassed the fans get by it. I think at some point, you really just have to come to terms with that fact and move on. This said, I can see the argument for how it's a symbol of how the New Adventures Seventh Doctor is a darker character than his TV incarnation. But it still smacks of embarrassment. I feel so sorry for you, growing up as a member of a despised and ridiculed minority, when just over 20 years earlier things were so much different. We unashamedly played "Doctor Who" at school, and on November 30th 1968 my birthday party was paused so we could all watch episode 5 of "The Invasion"! You wouldn't have gotten that level of universal acceptance in the 80s and 90s! I think we had very similar upbringings. This seems too strong. There's a long history of space adventure that's about people trying to escape from imperialism (with Firefly being the most obvious modern example). Instead McIntee offers a vision of a Lovecraftian universe bubbling in the erased cultures of colonialism, such that what was erased by our imperialist fantasies creeps back. As in Howard's stories (both influencing and being influenced by Lovecraft) of Pictish resistance to Roman imperialism. You know, this is what's been bothering me about the Sixth Doctor suit for a while, unconsciously. Not that it isn't, in theory, a good idea - I do enjoy that sort of retroactive playing with the difference between media - but simply the way some fans treat it. I like the pullover, but I love the safari suit as well (it reminds me of former MP Martin Bell). Interesting that as they were making the Doctor darker, they gave him a lighter-coloured outfit. Yeah. There's always been an imperialistic thread, of course, but there's always been several others (including, of course, the "get away from the overbearing jerks at home" one, which is meant as a reaction against imperialism but can turn into it if it goes wrong). I have to agree with BeserkRL here too. I hate to keep bringing up Star Trek in the 80s and 90s, but under Rick Berman and Micheal Piller, and especially under Ron Moore and Ira Behr, it really did become an outright deconstruction and rejection of the Neo-Imperialist tradition the Original Series was made with in mind. Battlestar Galactica too, though I agree Firefly is probably the best example. I would also argue Doctor Who was concerned with the Neo-Imperialism and technoscientific utopian futurism of Golden Age science fiction even as late as 1969, with "The Seeds of Death" and "The Space Pirates" being overt critiques of it. Heck, you could probably even make a case for "The Ambassadors of Death" too. I'm not sure that the turn of space-based sci-fi to a critique of imperialism in the 80s and 90s is a point against me so much as what I'm saying - that the vision of a space-based future is necessarily entangled in imperialism. Once space stopped being the future we expected sci-fi about it became in part a critique, but that's largely to be expected. The fantasy is still about imperialism. A critique of imperialism is hardly an abandonment of the imperialist fantasy. On a different tack, I was really interested in your lack of ability to read some of the New Adventures. I haven't been diagnosed with ADD and I have never read White Darkness in its entirety. Nor Sanctuary, First Frontier, Bullet Time...but I always thought it was the author's fault, not mine. I can also skate across pages and pages of Justin Richards' work: not because of my reading skills but because I find it dull and unrewarding. Also, no one mentioned White Darkness' debt to the movie of Live and Let Die, from whence some of its imagery is "borrowed". Certainly the space race and technoscientific prognostication is by necessity entangled with Cold War and imperialist themes extrapolated from the mood of the day and that shaped how Golden Age literature played out. That's a given. What I'm arguing is the genre need not be constrained by that any longer, and was actually making strides to distance itself from its imperialist heritage as early as the late 1960s (Raumpatrouille Orion is probably an even more blatant and scathing indictment of space-based Imperialism that I'm ashamed of myself for neglecting to mention before). I'm not convinced space-based science fiction is rooted in the Neo-Imperialist fantasy anymore (though with the dearth of it at the moment I can't say for sure it's dead and gone). It certainly need not be by definition and I think writers savvier than I have successfully problematized this particular aspect of the genre beyond the point it could be brought back unironically. Well, if it were just the McIntee books I'd think the problem was him, but he's far from the only author whose stuff I never finished. Having already done The Dark Path and The Face of the Enemy, I don't think McIntee is a hugely masterful writer, but I find him inoffensive. Though I can see how he'd drag. He's not one of the worst writers of the novels for me, though - for me the two really turgid ones are Bulis and Russell. Reading this blog entry is much more interesting than actually reading "White Darkness" itself. You've illuminated a lot of themes that should make the book fascinating, but don't. Or at least that's how I remember it. Haven't read it since the 90s. On another note, your accounts of being bullied make me appreciate my relatively civilized school district in Maryland. Mostly I was just ignored, rather than bullied. Also, I was a sophomore in high school when I discovered Doctor Who. Most kids in my district were beyond bullying by that point. If I had discovered it a few years earlier, the situation might've been much different. 7th and 8th grades are the worst. Those were bad enough as it was. "Because there’s a curious little death drive in this. It’s fun to be the cancelled show. It’s liberating to be at the bottom." Fascinating. I can remember some of the New Adventures well enough to agree that some of them were driven by this. If your only options are imperialism or a critique of imperialism then I don't think you have much in the way of distance from imperialism. Fair point about Bulis and Russell. I remember throwing Invasion of the Cat-People across the room at " You have not been give permission to mew". But that's not actually what shows like Star Trek: Deep Space Nine, Firefly, Battlestar Galactica and Babylon 5 are about, or at least not entirely. DS9 is an ensemble character drama about mundane daily life in Space Shanghai (with elements of political thrillers and spiritualist fiction) and BSG is a mash-up of mythology, theology, semi-sentient metafiction and leftist sociopolitical critique. I suppose you could level this at Firefly or B5 in spite of their political leanings, as the former is a Space Western, connected to US Neo-Imperialism as much as Westerns are always connected to it and the latter centering around the Space United Nations and ostensibly about Post-Imperialism. But even so I think eventually you're going to wind up with a problem in that imperialism has touched *all* aspects of Western thought: I think it would be hard to do a story about Westernism or Modernity that doesn't address it in one form or another. Even Doctor Who, as we've talked about before, has roots in some very unpleasant aspects of Victoriana. It's something it's kept having to deal with over the years, with changeable results. Agreed. I have a fierce case of the ADD. I did manage to get through "Legacy" and not hate it, but everything else by Gary Russell, I have not been able to crack. I got about 100 pages into Divided Loyalties on the strength(?) of its "so bad, it's great!" reputation, then stopped reading out of disinterest. Spiral Scratch actually looks interesting.. and I can't make myself care. However, anything by Kate Orman, Paul Cornell, Lawrence Miles, Steve Lyons, or Lloyd Rose... Click. I'm there. I have White Darkness somewhere. Your description of it made it look a lot more interesting than it seemed when I bought it back in 1993 (at Pandemonium Books and Games in Cambridge, MA - still there, folks...), so I might give it another shot. Ugh. Now, if that book had been anything CLOSE to a comedy, that would have been just fine. A planet full of deadly little kittie witties? I can see this happening. I can see Dave Stone having fun with it, or Paul Cornell. But egads... no, Invasion of the Cat People was not a good book. Probably worth mentioning the way that universal -- or at least widespread -- acceptance returned to the show during the last 7 years. Simply put: Space exploration fiction isn't all about imperialism because exploration itself isn't all about imperialism. Also, on bullying: Man. I'm sorry. Here's a bushelful of Internet hugs, if that counts for anything. My history with bullying is... tangled. I'm not entirely sure how much I was in school, simply because, looking back on it now, I can see that some things I mistook for people mocking or making fun of me were clearly attempts at friendly humor. @ Ununnilium: That's kind of my response as well, these days; I'm a lot more mellow about those kind of things now, including the safari suit, and I can see the logic behind it (even if I do confess I kind of like the Sixth Doctor's costume as well -- dressing the hero of your mainstream sci-fi show in that as brassy as brass balls if nothing else, although if it were my decision I'd have kept the coat and anchored with something a little more 'normal' underneath), but it just reeks of desperate embarrassment; as if they can magically stop Doctor Who being silly and make it more grown up by just changing a costume over. @ Matthew: I have to admit, I do appreciate a good bit of juxtaposition there (even if it's not exactly the most groundbreaking or complex -- putting your dark character in a light coloured suit isn't really that far removed from putting the good guy in a white hat and the bad guy in a black one). I dunno. My niece gets teased at school for being a Doctor Who fan. Probably - if I know bullies, which I do - by kids who do actually watch the show, but don't identify as "fans". A schoolfriend of mine in the 90s once organised a Doctor Who video night. A lot of kids came, they all enjoyed the episodes he picked (I can't remember what they were now), and it didn't make a blind bit of difference to how we were regarded. It depends a lot on the individual community. Two grades in the same school can have wildly different attitudes. I don’t know if I would categories the problems with the Sixth Doctor’s coat or the Seventh’s pullover as being about “insecurity or embarrassment.” I don’t think it is a secret that both Baker and McCoy were not fans of either of these parts of their costume and neither was Phillip Segal, who ditched the pullover when he made the TV Movie. Doctor Who magazine also dropped the pullover from a number of its stories too. I think the dropping of the pullover in the NAs and later Big Finish bring in the Blue Suite (which I am not a huge fan of either), were symbolic ways of righting some of the perceived wrongs of the JNT years. I didn’t have a problem in 1986 with Baker’s outfit or later McCoy’s pullover, but I welcomed the change of the latter. I didn’t feel the change was needed because I was “embarrassed” or I was “silly for liking” Doctor Who. For me it cemented that the Doctor had progressed for the McCoy’s TV portrayal to the Seventh Doctor of the NAs, so the change, for me, felt natural. I know Scott said that it was a “pretty futile change” and only a “niche corner” would notice, but at that time I didn’t really care if the greater world would know. Maybe as an American Doctor Who fan I had always lived on an island so changes to the TV series held no more weight than those in the New Adventures. I had very few friends who were into Doctor Who, so to me the NAs were just as real as the TV show had ever been. Pedantry: June 93 only sees Wiles' first attempt to proving FLT, I think, not the correct version. I also have to say Phil, if I may address you as such, that my son has ADHD and has just gone into high school, which is a great worry to me. To see someone with a similar condition who has obviously worked so hard on his qualifications and whose opinions are the highlights of my week is such a great reassurance. Cheers. @Phil: I got a message from him on Facebook a year or so ago, apologizing for what happened well over a decade ago. It meant the world to me. But I couldn’t bring myself to respond. I was at a loss for words, unable to conceive of what a world where I forgave him even looked like even as I did just that. I still haven’t written back. I still haven’t actually finished Theatre of War either. Sometimes we need our wounds more than we need atonement. @Scott: I think you're right that on some level we do need that sense of victimhood and exclusion; it's ultimately as much a part of us as everything else that composes who we are. I am the cause of my own suffering -- I took this to heart five years ago, and forgave all my childhood woundings, which includes bullying and other forms of predation and abuse. And this conferred a strange sense of power within me; I'm still not sure what it is. It's really weird and fucked up to say it, but I'm grateful for the wounding I received. It made me who I am, and I wouldn't change who I am, not anymore, so I have to accept that suffering, though borne out of a meaningless, stochastic universe, as something essential to what makes me, me, monster and angel. I wouldn't have it any other way. I'm reminded of a terribly cheesy parable: the acorn cracks, and this is its great wounding, but it must take this wound if it's ever to grow into an oak tree. I like the (deliberate) inversion - as a British fan I do literally live on an island. But each individual NA is inevitably more insular than each TV episode, in that the consistent, ever-present visual background is simply not there. I could read the next ten NAs without knowing that the jumper was gone -unless and until the author or editor inserted a description of the new costume. I had the same problem with Love and War. I like Big Night Out as much as anyone, but the Vic Reeves cameo pulled me out of the narrative, as did the sundry lyrics references and other in-jokes. I do recommend you look into the work of Viktor Frankly, whose approach to meaning in life seems to address -- and complement -- what you're describing perfectly. And his own story is an extraordinary one: far more so, in my opinion, than those of the other two 'great' Viennese psychological theorists, Freud and Adler. Frankl, that is, not Frankly. So DS9, which is a series about a former colony that's been given independence and is currently attempting to forge its own way as a sovereign power, while dealing with a benevolent foreign government that is nonetheless distrusted because its "coalition" is viewed by some as colonialism under another guise, while attempting to protect a vital resource that is clearly theirs but that they don't have the military might to defend on their own...is NOT about imperialism? Wow. That's a very different take on it than the ones I've seen. 1. I'm tentatively putting the critical imprinting age for Doctor Who at 11. The more I see, the more I'm convinced that's the time when you'll decide what Doctor Who is and should be. I was watching PBS omnibus editions of Pertwee, Baker, and Davison around that time, and so as much as I admire parts of the Hartnell and Troughton eras they still seem like relics to me, and everything from Colin Baker on has always seemed just a little bit ersatz in comparison, including the new series. All bets are off if you come to the show as an adult, of course, but I note that you were hitting the New Adventures around this time and lo and behold, that's _your_ Doctor. 2. I did the skimming thing a lot too. English was one of my worst subjects in school (relatively speaking) until they stopped grading based on whether you remembered details of the plot and started grading based on whether you could articulate what the story was actually about and what it meant. I used to say I'd "moved my eyes over" all of the Lord of the Rings books, but I didn't actually _read_ them until I was an adult and the movies were about to come out. That's when I discovered that interesting things actually happened in The Two Towers, and that the story wasn't just ringwraiths and a giant spider. 3. It's exhausting to have to call out the moral failings (racism, imperialism, etc.) in literature. You're a better man than I am for being able to manage that part of your job without letting it get you down. 5. Kids are assholes, junior high kids doubly so. I don't think I had it as bad as you did, but these traumas expand to fill the brain space provided. I'm Facebook "friends" with people from that time and it continually surprises me. I have no idea what the worst bullies are doing, though, and I have no idea what I would say to them in your position. Most of the emotional bruises have faded, but I couldn't sincerely say "it's cool, you were young, you only filled me with dread and hostility to humanity part of the time." A remarkably astute observation, 'Julia David'.